Two visitors to north Wales have given up part of their break to clean up a Gwynedd beach they said had the "most appalling" plastic pollution. Tim and Ros Birch, from Derbyshire, want an "urgent clean up" at Porth Neigwl beach, also known as Hell's Mouth, near Abersoch. "This is such a stunning beach," said Mr Birch. "The plastic clearly shows the pollution crisis in our oceans." Gwynedd council said there is regular beach cleaning at Porth Neigwl. 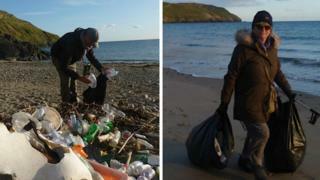 Keep Wales Tidy hosted a cleaning event in February but rubbish from as far away as France and Spain has since washed up on the Llyn Peninsula beach. Mr and Mrs Birch have already spent two days out of their ten-day break to Aberdaron picking up litter on the beach and plan to return again before the end of their holiday. Mr Birch, a former Greenpeace worker, said the pollution was "shocking" and worse than anything he had seen on beaches in developing countries. "We need action," he added. "This plastic is a major threat to local wildlife and also is not good for the tourist industry. This beach is part of the Wales coastal path. "We urge Gwynedd council to clean the beach up but recognise this is a massive ongoing job given the amount of plastic in our oceans." A Gwynedd council spokesman said: "Regular beach cleaning events are held at Porth Neigwl, primarily by a volunteer group which has adopted the beach. "All the litter that is gathered by the group is collected and disposed of by Gwynedd Council. "Porth Neigwl is west-facing and is open to prevailing winds and currents and so is very prone to significant deposits of waste materials such as plastics which have been dumped elsewhere and carried by the tide."